….to visit the …… fairy princess. My darling little niece left me such a sweet phone message the other day I had to try and go visit, so my flights are all booked, the boys and Jim are organised. So the first week in December I am off, free for a few days, well apart from all the girly things I will have to do. Better start getting supplies in now starting with a big packet of glue sticks, that girl LOVES to stick! We have had a couple of days of sick boys here which is not too much fun, still waiting for blood results for one teenager. A huge art project has been taking up MY table for the last few days, so its now gone and I might manage to do something, though we are having dinner guests tomorrow so we may need it to eat off! Christmas presents will have to be finished to take to London rather than have my Mum take them home, that kinda cuts the time frame by about 3 weeks. My brother got an IOU for socks last year, which was because he requested them 2 weeks before christmas, but I better finish these for him soon. 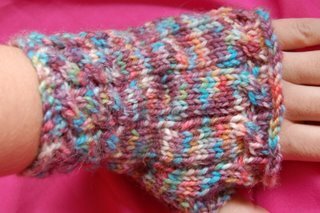 I have finished one Fetching mitten in Jakes yarn, I am still not convinced they are nice but he likes them. I got new needles to knit the other one as the metal needles were hurting my hands, though I could only get long bamboo ones here in 4mm so might do a little swop with my Mum when she arrives at Christmas as she doesn’t mind them a bit longer. 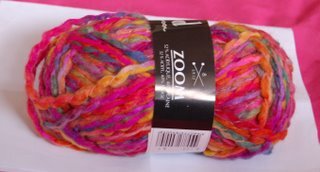 I bought this while I was in the yarn shop today, I think its new as I haven’t noticed it before, I thought it might make a nice colourful hat for my niece. No2 son is off to celebrate Thanksgiving with his friend tomorrow so I have a Chocolate Fudge cake to make, better get to it……. i’m so jealous! i wish i was going to londong too! Just catching up – I’ve been so busy at work ! So here goes – Belated Happy Birthdays to the not-at-all-grumpy-looking-gorgeous boy (hair colour sorted out then ??) Actually, I think Jake’s right, the colour works out quite well once you see a whole glove and finally, have a great time in London ! Wish I was going too but I think it will be Spring before I next get down to see my sister and neices and nephew.